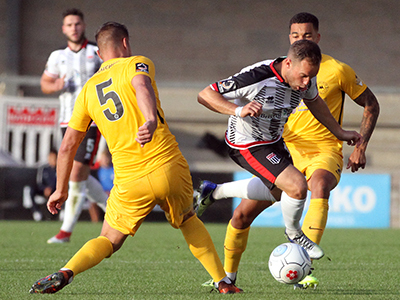 City are still looking for their first point of the 2018-19 season after they slipped to a single goal defeat at Torquay United this evening. Although City more than matched their full-time opponent’s for much of the clash the only goal of the game came with 10 minutes left when Davis fired a low shot through a crowded penalty box into the corner of the net. Despite a great early chance for the home side – Williams blasting high over Ryan Clarke’s goal on four minutes – City enjoyed the better of the opening exchanges without testing MacDonald in the Gulls goal. They had an escape on 22 minutes when Williams looped a header onto the top of the bar but continued to pass the ball around well on the excellent Plainmoor surface. Ross Stearn stung the palms of MacDonald on 36 minutes after one such move as City finished the half on top once again. And they should had gone in front four minutes after the interval when MacDonald flapped at a high cross only for John Mills to volley over the unguarded goal from a couple of yards out. Several promising moves followed but the hosts were beginning to pose a greater threat going foward and push City onto the back-foot. Just past the hour mark though City came within inches of taking the lead, Stearn whipping in a great cross that Andy Watkins headed against the bar. This would be as close as City would come and they had several nervous moments before Davis struck on 80 minutes.